October is Breast Cancer Awareness Month. Did you know that every day in Ireland 12 woman are diagnosed with breast cancer? 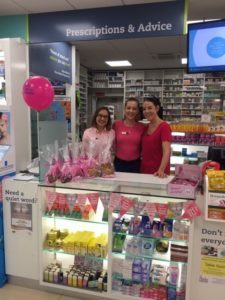 This month the Irish Cancer Society are encouraging women of all ages to become more breast aware. Breast awareness is about knowing what feels normal for you, that way if any changes occur you will recognise them much sooner. 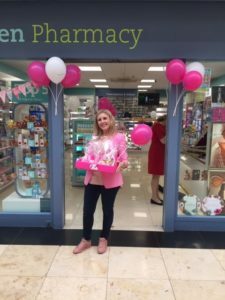 1 in 10 women in Ireland will develop breast cancer during their lifetime – and early detection is your best defense against cancer! 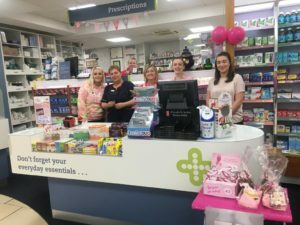 Haven Pharmacy Raffertys joined the Irish Cancer Society in the fight against cancer by hosting a Cups Against Breast Cancer coffee morning in both Stillorgan and Cornelscourt Pharmacies and they managed to raise a whopping €1,530!!! 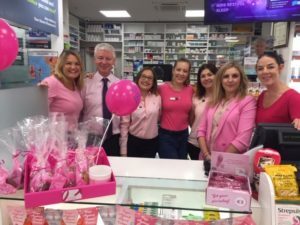 All the staff looked pretty in pink for the day including Pharmacies Owner John Rafferty, who looked very dapper in his pink shirt! 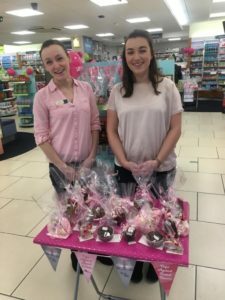 The staff in both Stillorgan and Cornelscourt pharmacies baked lots of goodies including chocolate cakes, cupcakes, tray bakes and buns – and they went down a treat!!! By hosting the Cups Against Cancer coffee morning this October Haven supported patients with breast cancer and their families. 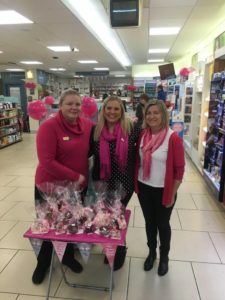 The donations from the coffee morning will fund research and support services for breast cancer patients across Ireland. You can still support this worthy cause by purchasing a pink pin in the pharmacy and placing your donations in the box on the counter.